Frequently Asked ( Doggy GOO ) Questions. Here are some common Questions about Doggy GOO / Healthy GOO ™. If You do not see your Question, Please feel Free to Call / 855-246-2426 (CST) or contact us. Who is Healthy GOO ™? Healthy GOO ™ is a newly created, privately held, U.S.A. business entity under the leadership of Stephen Hauer M.S.M. M.B.A..
Stephen Hauer has been professionally involved in the “Human” medical world for over 35 years, and for 8 years has been / is the Principal of GOOy CHEWy Relief, a “Human” Allergy Supplement Company. 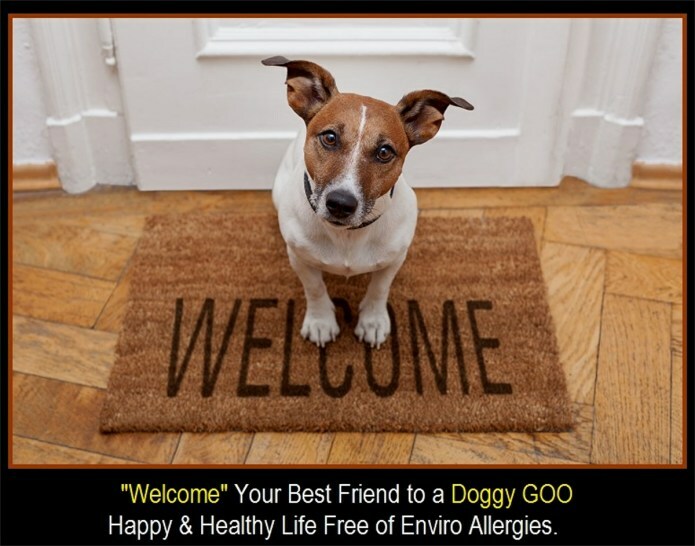 Much like Doggy GOO, GOOy CHEWy Relief builds Immune Tolerance / Neutralizes 14 Major “Human” Aero-Enviro Seasonal & Year-round offending allergens. It was through Stephen’s experience in neutralizing allergies in humans, together with the Medical / Allergist Consultant Guidance of a DVM Allergist / Veterinary dermatologist expertise and insight, that together they recognized and identified a population of canines who suffered from allergy to Environmentals and who could benefit from their combined expertise toward turning sad dogs into happy dogs. What’s with the “GOO” in Healthy GOO ™? The GOO in Healthy GOO ™ was chosen because it sounds cute and playful, reflecting the fun that health brings to your dog. But, please do not be fooled by the cute and playful name, because Doggy GOO ™ is all (veterinary dermatologist approved) business, when it comes to supporting immune health and tolerance in your dog. In addition to sounding cute and playful, the name GOO was chosen because one of the most important ingredients in Doggy GOO ™ is arguably, the best organic (human) nut butter that money can buy! And as we all know, not only is nut butter GOOey , but dogs just love peanut butter! So Doggy GOO ™ is not only an immune health supplement, but a tasty treat. Why is a Medical Director / Veterinary Dermatologist Consultant important to Healthy GOO ™ / Doggy GOO ™? Healthy GOO ™ is focused on supporting and balancing your pet’s healthy immune system, as well as building environmental & food tolerance in your pet’s immune system. To successfully do so, it must draw on the very best medical / clinical veterinary leadership available. “In the field of veterinary medicine, the ‘go to’ leaders for all things allergy in our pets are veterinary dermatologists. Worldwide, there are only a few hundred veterinary dermatologists!”. In the United States, the letters DACVD are used for this professional designation; they stand for Diplomat of the American College of Veterinary Dermatology. It is under the medical / clinical / Medical Director leadership of a Veterinary Dermatologist Consultant, that Doggy GOO ™ has been conceived, researched, formulated and created. A veterinary dermatologist is a veterinarian with expertise in the diagnosis and treatment of animal skin, ear, hair, nail disorders. Specifically, veterinary dermatologists have significant training and experience in the management of allergic skin diseases. Additionally, their professional background makes veterinary dermatologists extremely qualified in recognizing and treating infectious skin diseases (e.g., bacterial, fungal, viral), parasitic skin diseases, dander-related skin disorders, alopecia (hair loss), congenital skin diseases, autoimmune skin diseases, benign and malignant skin cancer, hormonal-related skin diseases, and other internal (systemic) causes for skin abnormalities. Chronic infections and inflammatory conditions of the ears are generally related to skin disorders and veterinary dermatologists have familiarity in managing chronic ear disorders. Veterinary dermatologists can identify skin lesions/sores and the patterns they form on animals, which aids in the selection of proper diagnostic procedures. Many specialized diagnostic procedures are used by veterinary dermatologists including, but not limited to skin cytology, skin scrapings, skin/ear cultures, skin testing, and skin biopsies. The training and experience of veterinary dermatologists may include the use of cryosurgery with the use of freezing surgical units, laser surgery, varying biopsy techniques, and video otoscopy (use of a camera to examine the ear canals). It is important for veterinary dermatology specialists to stay abreast of improvements in the identification, diagnosis, prognosis, and therapy of recognized and newly recognized skin diseases. This is accomplished by attending continuing education conferences. Continuing education is a requirement for maintaining board-certification with the American College of Veterinary Dermatology (ACVD) as well as many state veterinary licensing boards. The ACVD co-sponsors the North American Veterinary Dermatology Forum, an annual scientific program, as well as the World Congress of Veterinary Dermatology, an international meeting held every 4 years. Why just Doggy GOO ™? Healthy GOO ™ chose Doggy GOO ™ as its first product, because unfortunately, the incidence of an out-of-balanced immune system is more prevalent in our canine population than our feline population. However, please be assured that in the soon future, Healthy GOO ™ will add Kitty GOO ™ to its product family. Kitty GOO ™ will be reflect much the same principals/ methodology and ingredients that are used in Doggy GOO ™, but re-GOO’ed to reflect the special needs, requirements and tastes of our feline population. Where can I purchase Doggy GOO ™? Presently, Doggy GOO ™ can be purchased via our DoggyGOO.com or HealthyGOO.com website. With regard to Doggy GOO’s market launch / availability, Healthy GOO ™ has identified pet groomers as the first “go to pet professional” on which to begin to build Doggy GOO ™ awareness. Not only do pet groomers love pets, but every day, they see firsthand the coat, skin and ear ravages that an out-of-balance immune system can have on their pet customers. Still further, they are often the first line of professional advice to concerned pet parents regarding the health and appearance of their pet. It is through the initial Doggy GOO ™ support of pet groomers, their pet boutiques and boarding facilities that Doggy GOO ™ wishes to spread the GOO to every day pet parents, veterinarians, breeders and pet supply pet professionals. When Your Dog’s Immune System is Out-of-Balance. What are typical Sources of Allergy in Dogs? When many pet owners think of allergies, they immediately gravitate towards fleas and contact allergies. It used to be that flea allergy was the most common allergy in pets. Fortunately, due to the myriad of excellent flea products on the market, the incidence of flea allergies in pets has significantly dwindled. Contact allergies are not very common, despite the readiness for pet owners to change their pets’ bowls from plastic to metal. Wool and cotton allergies are possibilities, but not as common as environmental allergies. However, environmental allergens such as grass, tree, weed pollens, house & dust mites and mold spores; followed by allergy to food sources are most common. The incidence of allergy in today’s population has been estimated to be up to 25%. A breakout between environmental allergy and food allergy is 85% and 15% respectively. Are some Breeds more susceptible to Atopic Dermatitis / Allergy than others? Any breed of dog may be affected, but some are more prone than others. Unfortunately, some of our most popular breeds have been determined to be genetically predisposed to allergy vs. others. When do Allergy Symptoms appear? Signs of canine atopic dermatitis usually first appear between 1 and 3 years of age. Initially there may be no visible lesions or just redness of skin. The disease may start seasonally, but usually this progresses to year-round disease, often with seasonal exacerbations. The clinical signs often increase and decrease in severity, depending on the level of exposure to allergens and the presence of secondary infections or concurrent allergic diseases. Many of the signs that develop are due to secondary damage caused by self-trauma. Other lesions such as pustules, crusted papules and epidermal collarettes may develop due to secondary infections. Signs may also be exacerbated or altered by secondary factors such as the presence of fleas or infections. Some dogs present with only recurrent ear issues. Does geographical location influence allergy? Yes, from the standpoint that your dog may be allergic to seasonal / geo-regional environmental sources i.e. grass, tree, weed pollens. If this is the case, there may be a year-round presence of allergy to year-round allergy sources i.e. mites, but when mother nature begins her seasonal pollen machine, the combination of year-round allergens and seasonal allergens equals allergy discomfort. What are the most common signs (symptoms) that my dog has allergies? You will usually see scratching, licking the paws, rubbing the face, or watery eyes. The most destructive of these is scratching, since an animal can scratch himself raw, which can eventually lead to secondary infections, excessive shedding, and hair loss. It is important to remember that even though your pet may show some or all of these signs, he may not have allergies. He may be suffering from any number of other medical conditions, such as fleas or hormonal disorders. This is why it is important to visit your veterinarian for an accurate diagnosis. What are some common types of allergies? Atopy or allergic inhalant dermatitis (when your pet is sensitive to airborne particles) by far accounts for most skin problems in dogs. Unlike humans, your pet’s reaction is not to sneeze out whatever is causing the allergy. Although pets do exhibit watery eyes and some sneezing, animals mostly show reactions in their skin. They typically chew at their paws, scratch at their skin, and in some cases, develop secondary skin and ear infections. Common allergens include trees, grass, and weed pollens, house dust, molds, and dander. Flea Allergy Dermatitis (FAD) is another common allergy in pets. Pets with FAD are not only irritated by flea bites, but are allergic to the parasite’s saliva. When the pet receives his first flea bite, his immune system responds and is hyper activated. Then, when the pet is bitten again, a more severe itching occurs, causing intense scratching. This not only starts a seemingly never-ending itch cycle, it also causes hive-like lesions from all of the bites, making the pet very uncomfortable. Contact Dermatitis is an allergic reaction to a substance that touches the skin. Common products that can cause contact allergies are plastics, fabrics, and topical antibiotics. Typically, animals that suffer from these have reddened itchy skin covered in small, pus-filled welts. Caustic substances such as certain chemicals and poison ivy may cause a condition called irritant contact dermatitis, which should not be confused with an allergy. Food sensitivity is a general and more fitting term for what pet owners think of as ‘food allergies.’ The umbrella group of ‘food sensitivities’ actually includes food intolerance (which shows up as flatulence, vomiting, and diarrhea) and food allergies, a reaction of your pet’s immune system that manifests in the skin. Most often, proteins are the culprits. Milk, soy, beef, and pork are some examples. At what age could my dog begin to develop allergies? Some allergies are passed down genetically from parents to offspring. Most dogs develop allergies between one and four years of age. Some breeds are genetically predisposed to a higher incidence of allergy. Doggy GOO Feeding Questions & Suggestions. Is Doggy GOO ™ a Treat? No, it is a canine immune system supplement that tastes like a treat. Pet owners are cautioned not to fall for their dogs’ “requests” for more Doggy GOO ™. Doggy GOO ™ has been formulated specifically to be ingested per the label’s instructions. Can Doggy GOO ™ be mixed with other foods or treats? No, Doggy GOO ™ has been specifically formulated to achieve its health benefits when consumed all by its GOO-self. Why is so important that Doggy GOO ™ be thinly spread onto the bottom of a clean bowl? While some of Doggy GOO’s ingredients need only be ingested to produce their health benefits, other ingredients require that small amounts be brought into the dog’s mouth and retained. By thinly spreading Doggy GOO ™ onto a bowl, your dog is required to repeatedly lick up the Doggy GOO ™ to fully consume. With each lick, your dog’s mouth is slathered with these ingredients long enough that they can do their GOO job. When I initially begin giving my dog his / her Doggy GOO ™, do you have any suggestions? Yes, whereas it is not required or absolutely necessary, you may wish to start with 1/2 the recommended amount for the first week, then give the full amount after that. It will vary, depending on your dog’s specific health status, age, and duration of any immune imbalance. The benefits of Doggy GOO will take time; you cannot rush Mother Nature. Healthy GOO ™ suggests that your pet continue a daily ingestion for a period of at least 90 uninterrupted days together with a nutritious diet. By the end of 90 days, you should begin to notice that “Healthy GOO Glow” ™! Do not stop though – Keep the “GOO Glow” going for your pet …and you! My Dog is beginning to show improvement from his / her “stressed” health status, how soon do I move to a “well” amount? Continue your dog under “stressed” amounts for 1 or 2 weeks following improvement, after which “well” amounts can be provided. When Doggy GOO ™ says that it builds natural immune system tolerance to everyday environmental health aggressors, what does this mean? Doggy GOO ™ contains natural elements of common offending environmental sources. By exposing your dog’s immune system to daily, small environmental amounts, the natural adaptive capabilities of your dog’s immune system is, little by little, retrained to no longer see harmless allergens as harmful. Once re-identified as harmless, your dog’s immune system will no longer go into attack mode with their presence. What precautions do you suggest regarding Doggy GOO’s Peanut Butter ingredient? While dogs just love peanut butter, some of us humans do not. In fact, there may be household members, and even visiting friends, who are allergic to peanuts. In these instances, it is regrettable that Healthy GOO ™ suggests that Doggy GOO ™ not be present in such a peanut allergy household. Beyond its peanut butter content, there is a strong chance that even though your dog has visibility licked up his / her Doggy GOO ™, it is possible that trace amounts remain in the bowl which may elicit a unfavorable peanut allergy reaction. What if my pet just cannot get enough of Doggy GOO ™? Can I give him / her more than the suggested daily amount? Doggy GOO ™ should not be viewed as a treat. Doggy GOO is a Canine Immune System Health Supplement, which has been formulated to confer health benefits to your dog as per the label. Think of Doggy GOO ™ similar to a vitamin that you or your dog may take. Just like taking too many vitamins, taking too much Doggy GOO ™ may upset your dog’s system. So, regardless of what your dog says, please administer per the label instructions. 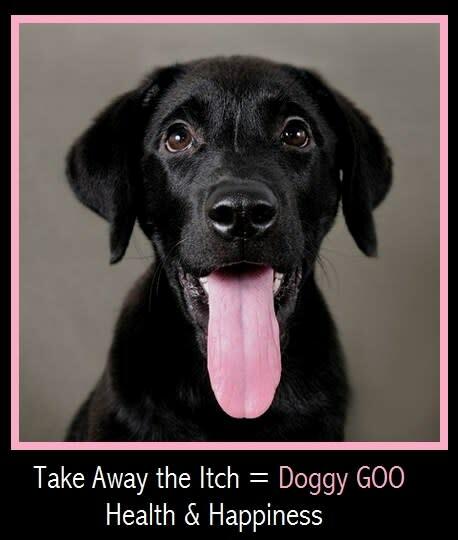 But, once Your Animal is well into the STRESS’ed Phase of Doggy GOO’s Protocol… And is beginning to Demonstrate Visible and Behavioral Improvement, it is “OK” to Increase the Daily AM & PM Amount by approximately 50% with the Doggy GOO Goal, that the Increase will Accelerate the Progress toward a Healthy GOO / Doggy GOO Goal. Then once Your Animal’s External & Behavioral Sytmptoms have appreciably Subsided, it is OK to Reduce to the Standard STRESS’ed Phase Amount. And, once the 90 Day STRESS’ed Phase duration has been completed, the WELL Phase can be implemented. What Daily GOO Amount / Frequency > Do I START with ? DOG or Human, No One Likes ( Rapid ) Change. Start with 1/2 “Well” Dose / Day > 5 – 7 Days. 2nd Week > Well Dose / Day. Frequency of GOO = Minimum 1X / Day or Desired 2X / Day ] Adjust Amount / Dose accordingly. How do I know if my Dog will Like Doggy GOO? Good Question. While Peanut Butter was chosen by the Doggy GOO Formulators because DOG’s Like to Lick UP Peanut Butter, if you would like to see if your Dog will Like / Lick their Doggy GOO, we suggest taking a small amount of good quality Peanut Butter, spread it thinly on a clean plate, place it in front of your Dog and see what happens. It is our hope that your Dog will find that Peanut Butter tastes Great and later find Doggy GOO to be GOO-licious! What is Doggy GOO ™? Doggy GOO is a canine immune system health supplement. Simultaneously targets, supports, and balances a healthy immune system, while building immune tolerance to everyday offending allergens. Give your best friend a Healthy GOO Glow™ with Doggy GOO™. Which tiers of my dog’s immune system are targeted / supported / balanced with Doggy GOO ™? Gut – While technically a part of the innate immune system, because of its immunological importance and autonomous functionality, the gut (stomach, esophagus, intestine, and colon) has been nicknamed “the second brain”. Recent research is revealing that the gut does much more than merely handle digestion. The little brain in our innards, in connection with the big one in our skulls, partly determines our mental state and plays key roles in certain diseases throughout the body. To say that our two brains – the one in the head and the one in our bowel – must cooperate is an understatement. If they do not, then chaos ensues. Is Doggy GOO ™ Drug FREE ? Yes, Doggy GOO’s health benefits are achieved via 100% naturally, with organic ingredients. What is a Healthy GOO Glow ™? A Healthy GOO ™ “Glow” is the external and internal strength, vitality and wellness that your pet exhibits when their immune system is in balance and defended everyday health aggressors are a Doggy GOO ™ dog. Healthy GOO ™ has chosen the term glow to represent not only the inner strength of an immune system that is in balance and strong, but the outward glow and wellness pirit that your pet will display when their immune system is in balance and defended against everyday health aggressors. Then all they have to worry about is having Doggy GOO ™ fun with you, their pet parent. What does Power to Defend ™ mean? Healthy GOO ™ believes that your dog’s immune system has the natural ability to fight off what Mother Nature throws at it every day. But, it can always use a little help. This is where Doggy GOO ™ comes in. Healthy GOO ™ contends that the daily use of Doggy GOO ™ is such that it supports, balances and builds tolerance in your dog’s immune system. It is through its daily use, that your pet’s immune system is able to do its immune system “thing”. Healthy GOO ™ calls this the > Power to Defend ™. Can Doggy GOO ™ draw from the results of any clinical studies? The Answer to this Question is YES ! Healthy GOO™ is proud to say that EACH of Doggy GOO’s™ Ingredient Groups have Clinical Studies which support their respective stated Canine Health Benefits ( See Doggy GOO™ Ingredient Page for Clinical Study Listings ). Doggy GOO’s™ Ingredient Groups have been specifically chosen to simultaneously Target, Support and Balance the Health, Functionality and Immune Response of the respective Innate, Acquired and GUT Tiers of your Dog’s Immune System; 100% GOO-licious Naturally ! Every aspect of Doggy GOO™, from Ingredients, to Formulation, to Delivery Methodology, to Processing, to YOUR Pet; has been thoroughly evaluated by Healthy GOO’s? Medical Director & Veterinary Dermatologist to ensure YOUR Pet’s Healthy GOO Glow™. Healthy GOO™ is especially Excited and Proud to share with Canine Pet Parents the exciting NEWs that Doggy GOO’s™ Pet Friendly / Sublingual Methodology has been Clinically shown to be EQUAL, if not Superior to traditional “Gold Standard” Immuno-Allergy SHOTs in the neutralization of Canine Dust Mite Allergies. Doggy GOO™ builds Immune System Tolerance to 10 Pollens, 2 Mites and 3 Molds..
PLUS Beneficial Yeast ingredients for 1st Line / Innate Tier Immune Health Defenses. Tri-GOO Synergy: Doggy GOO is ALL About the sustained Health of your DOG’s Immune System. Innate Immune System Tier: 100% Natural, Beneficial Fermented Yeast Support & Balance 1st Line Immune system Defenses / Response. Acquired Immune System Tier: The Sublingual introduction of 100% Natural Environmental Extracts builds and strengthens Immune System Tolerance to everyday offending Allergy Sources i.e. Pollens, Mites, Mold Spores & Foods. GUT Immune System Tier: Pre and Probiotic’s maintain Healthy GUT Function, Improve Digestive function and enhance nutrient absorption / Immune Response. While the “GOO” in Doggy GOO is not specifically an Immune System Tier, the Best Therapy Treatment in the World is Useless if the PET or Pet Owner is Non-Compliant.Which is why, Doggy GOO uses the Best Organic Peanut Butter money can buy, not only providing the perfect sublingual “Carrier” for Doggy GOO’s Health Ingredients, but also providing an excellent source of ALA-Omega 3, AND making Doggy GOO GOO-Licious for your Dog. Why “Simultaneously” support / balance the Innate, Acquired and Gut Tiers of my dog’s immune system? Isn’t it the same to address / treat just one or two individually vs. all at once? When the Overall End Benefit is Greater than the Sum of its Parts. Healthy GOO ™ takes an all-inclusive approach with the health focus of your dog’s immune system. It recognizes that your dog is made up of a multifaceted, interconnected, overlapping, interdependent network of complex entities which all work together toward the health and well-being of your dog. When one facet is not “just right” not only do other facets try to compensate, but it creates an imbalance within your dog. This imbalance, in many cases, if left unaddressed can lead to a cascade degradation not only to the initial “problem facet / area”, but the other interacting facets as well. It is based on this belief and understanding that Doggy GOO ™ has chosen not to just focus on one facet of your dog’s immune system, but rather to simultaneously target, support and balance each of the major tiers of your dog’s immune system i.e. Innate, Acquired & Gut tiers. Healthy GOO ™ calls this strategy > Tri GOO Synergy ™. Some Breeds are genetically predisposed to immune system imbalance i.e. allergies. Can I do anything to lessen the odds of allergy in a litter? Healthy GOO ™ suggests that pups begin Doggy GOO ™ as soon after birth as possible to allow the pups natural immune system defenses to naturally begin to build “pre-emptive” tolerance to what may be future offending grass, weed, tree pollens, mites, molds and even foods, before they have a chance to become entrenched.While at this time there are no direct clinical studies to support this position, based on Healthy GOO’s veterinary expertise / medical knowledge, as well as knowledge of human desensitization, this “anecdotal suggestion” may someday be supported by clinical studies.Building even further on this suggestion, Healthy GOO ™ suggests that mother dog begin Doggy GOO ™ before she becomes pregnant, into pregnancy, following birth into nursing as a means to conferring her environmental tolerance benefits to her pups. I want my pup’s immune system to be at peak performance as soon as possible. How soon can I begin Doggy GOO ™ with my new pup? Healthy GOO ™ suggests that you can begin your pup on Doggy GOO ™ as early as 6-8 weeks or whenever they are able to lick Doggy GOO ™ from their bowls. Will Feeding Novel FOOD Proteins Help my DOGs Itchy Allergies ? Skin and ear conditions, caused by pet allergies, are probably the most treated condition in pets, especially in the Western part of the United States. Without veterinary confirmation, most owners attribute these conditions to the food they are feeding to their pets and seek foods with novel proteins (venison, duck, lamb etc.) to feed their pets instead. Unfortunately is this not only a mistaken response, it also means that veterinarians will have limited ability to treat “real” food allergies in the future. Most skin and ear allergic conditions are a response to airborne pollens and not food (85-98 percent, depending on whose research is quoted). I know it seems strange, but when allergic animals breathe in pollens, their immune system recognizes the pollen proteins as “foreign.” White blood cells and antibodies respond to these invaders by increasing the body’s histamine levels. For pets, elevated histamine levels cause itching, so the animals lick and bite at their skin. Paws foot pads, arm and leg pits, abdomens, and the back of the hind legs are favorite targets. Purple staining of the fur, raised sores on legs, infections between the toes, infected “hot spots” on long haired breeds, and chronic ear “infections” are all symptoms of pollen allergies. Only two patterns of skin symptoms are thought to be characteristic of food allergies. Chronic ear “infections” with red or pachydermatitis rectums (ears and rears) in dogs, and violent facial scratching in cats are suggestive of food allergies. This is not to say that food allergies are not a part of the allergic complex in any pet, but they are probably minor. Pollens / Enviro’s are the major culprit. Pollen allergies are difficult to determine. Expensive blood and/or skin tests are necessary. Treatment generally includes injections to desensitize the pet to the offensive pollen proteins or the use of other expensive drugs. Owners tend to balk at the expense and commitment of this approach. It is often much easier for them to blame the food and experiment with novel proteins. And often this solution is met with initial success, but then fails as time passes because food proteins are not the primary allergens. Allergies develop over time due to repeated exposure to offensive proteins. Immediate allergic reactions to pollens and food are rare. Allergic reactions to vaccinations, bee stings, and certain plant residues are exceptions and can occur on first exposure. Since food allergies occur over time, veterinarians treat this condition by recommending proteins that, up to now, were seldom present in most commercial pet foods. proteins). Unfortunately owner misunderstanding of allergies resulted in greater demand for foods with these novel proteins, and pet food manufacturers gladly responded. Now, premium foods feature novel proteins as regular ingredients. One brand offers lamb, duck, and venison in the same food! More and more pets are being exposed to novel proteins and will become sensitized to them, and veterinarians will be forced to seek even more exotic proteins for our food allergy patients. We may have to resort to recipes that contain ostrich and emu, kangaroo and wallaby, horse and zebra, guinea pigs and other pocket pets, large snakes, or other wild species the general public may find offensive as food sources, who will then boycott their use or will find them to be too expensive and will be unlikely to purchase them. Unless your pet has a confirmed food allergy, stick to a food with the more common proteins like beef, chicken, turkey, etc. Do what is necessary to identify the exact source of your pet’s allergies. ( 85% = Allergy to Enviro Sources ). Reserve the novel proteins in case your pet develops a true food allergy and your veterinarian needs to control the diet. Grain free fits in this same category. Does Doggy GOO have a Guarantee / Return Policy ? To begin, it is important to realize that the Health Status of every Animal is different and that many Co-Factors come into play, especially when it comes to Allergies / Atopy. That the Top 3 Health Issues seen by DVM’s are manifestations of the presence of Allergy. That Allergy MED’s only Temporarily Mask Symptoms, have nasty Side-Effects and Suppress the entire Immune system leaving animal vulnerable to Secondary Health Issues .. on Top of Allergy presence. That Allergy is a Mis-Wired Immune System. ( Severity of Allergy Issues ) as it Rolls Down Life’s Hill. Beginning at Birth and initially manifesting Seasonally then consistently moving to a Year-round Status. That 85% of our Paw Chewing, Licking, Itching, Skin & Ear Issue DOGs are Allergic to the Same Pollens, Dust Mites & Molds that We Are ! That their Itchy DOG’s Allergy Status began at birth, has progressed since then and that the animals present health status is the cumulative result of this disease progression. That Allergies become almost “Hard Wired” into the Dog’s immune system and to Reverse, Re-Establish, Build and Maintain Tolerance to offending Enviro allergens and mitigation of Allergy Itch Symptoms cannot be rushed and takes time. As a side note, ImmunoTherapy Allergy SHOTs, which are the Clinically proven, Gold Standard in Allergy neutralization can only claim a success rate to 65% complete allergy neutralization, 20% of significant allergy symptom reduction with another 15% that do not respond at all. And it is not uncommon for Veterinary Dermatologists to tell their Allergy SHOT Pet Patents that it takes 6 – 9 months before they “begin” to see symptom abatement. We are however, very excited to note that the “First Ever” Canine Clinical Study which compared Sublingual Delivery to Allergy SHOTs found Sublingual ImmunoTherapy to be Equal, if not Superior / Faster Symptom mitigation to traditional Allergy SHOTs in the neutralization of Dust Mite Allergies in DOGs. Further, it is important to note that Doggy GOO is a Canine Immune System Health “Supplement” and cannot makes claims of treatment, diagnose, cure or prevent etc.. In light of this Clinical Study Status, Doggy GOO’s Canine “Supplement” Claim Status, together with the fact that a DOG’s Immune system / Allergy Status is influenced by many other factors beyond Doggy GOO’s control; that Doggy GOO cannot make any Guarantees of Allergy or Health improvement. Thus said, You can see that Doggy GOO is a very Special Product and ask that Doggy GOO Customers understand that Healthy GOO cannot make any Guarantee’s etc. and as such, cannot offer a Return Policy. I hope that this has been helpful.We invite concerned Pet Parents to visit the Testimonial Page of www.DoggyGOO.com and read what other Pet Parents are saying about Doggy GOO.We also would invite Pet Parents to speak with their DVM to discuss the nature of Allergy / Atopy and the various Allergy CARE Treatment Options. As always, please feel free to contact Healthy GOO with any Questions you may have.